The cholera epidemic in Haiti is spreading twice as fast as had been estimated and is likely to result in hundreds of thousands of cases in the coming months, the UN says. The UN's humanitarian co-ordinator for Haiti, Nigel Fisher, said aid agencies would have to "ratchet up" their response and send more medical staff. 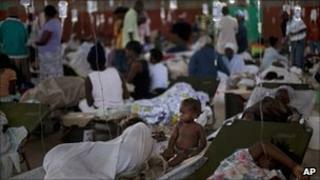 The Haitian government says 1415 people are confirmed to have died. The epidemic has complicated preparations for elections next Sunday. Mr Fisher said more than 200,000 cases of infection could be recorded in the first three months instead of six months as first estimated. "This epidemic is moving faster and we are in unknown territory in Haiti just because this is moving so fast. There is no immunity to it", he said. Mr Fisher added that the Haitian government would have to increase pressure on local authorities to find places for more treatment centres and to dispose of bodies. There has been some opposition to the placing of treatment centres from residents who fear they could bring the infection into their neighbourhoods. The UN under-secretary for humanitarian affairs, Valerie Amos, who is visiting Haiti, told the BBC there was an urgent need to train Haitian health workers, who have no previous experience of dealing with cholera. "We need to get the message out there to the people that this is something that can be dealt with. We need to make sure they know about hand-washing and proper sanitation, and we need to get supplies in", she said. Campaigning is meanwhile in full swing for Sunday's elections, when Haitians will elect a new president and legislative members. Some human rights groups and four of the 19 presidential candidates have called for the elections to be postponed because of the cholera epidemic. But the UN mission in Haiti, Minustah, says the conditions for a successful vote are good. "The government and the vast majority of candidates are really determined that these elections be held as planned," said the head of Minustah, Edmond Mulet. "As in the past we might see some intimidation or burning of ballots or polling stations, but we are prepared on the security side to face those challenges". There have been outbreaks of violence between rival political factions in the run-up to the vote. On Tuesday two people were shot dead in a clash between supporters of two candidates in the town of Beaumont in south-western Haiti. Last week there was also rioting directed against UN peacekeepers from Nepal, who some Haitians have accused of bringing cholera into the country. The UN says there is no evidence to support the accusation. Sunday's elections are seen as a crucial step towards giving Haiti a stable government that can lead recovery efforts after January's massive earthquake, which killed about 230,000 people and shattered the capital, Port-au-Prince. Some 19 candidates are vying to succeed current president, Rene Preval and it is likely that the election will go to a second round run-off on 16 January. Most candidates have insisted that the elections, which will also choose 99 deputies and 10 senators, should go ahead as planned. Are you in Haiti? Are you going to vote? Send us your views on the election and the current situation using the form below.